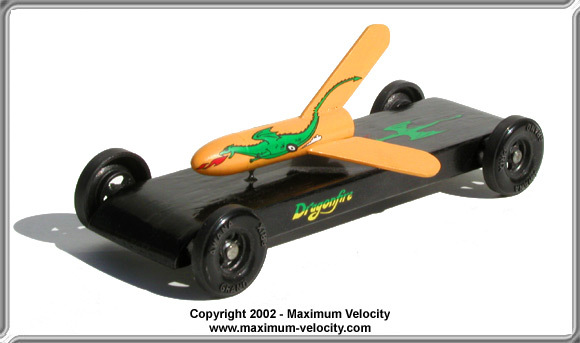 I really enjoy the Pinewood Derby. In fact, my level of enjoyment was probably greater than that of my children. Add the fact that I like to work with my hands, and you have the classic recipe for an over-involved parent. Yes, I admit I have been guilty of doing way too much work on my children’s cars. By contrast, I have seen cars at our weigh-ins that were clearly built by a younger child with little to no parental involvement. Generally, these cars place poorly, sometimes not even reaching the finish line. I believe that neither of these extremes is the appropriate level of parental involvement. Building a car is a great opportunity for a child and parent to spend time together. Opportunities to interact with your child are too few and far between to let one slip away. So how much should a parent be involved? I suggest that parents should serve mostly as a coach, allowing their child to do as much work on the car as he/she can physically and safely accomplish. Clearly, the level of involvement must vary based on age and physical capabilities. For example, my 12-year-old son’s latest car was built on his own with only some coaching from me. He got frustrated a few times, and when he did, I showed him a different way to hold a tool, clamp his car, hold the can of spray paint, etc., but he did the actual work. On the other hand, my 9-year-old daughter also built a car. She did a large majority of the work, but I helped set up the tools, and assisted when she needed a little extra muscle power and technique. How can you most effectively be a coach to your child? There is no one answer to this question, but here are some ideas that might be beneficial to you. Dig the Matchbox/Hot Wheels cars out of the toy box and find an interesting design. Then sketch the profile of the car on paper, simplifying it where needed. Have your child sketch a rough drawing of their ideas. Then work with them to make it practical. Look on the Internet for car design ideas. There are literally thousands of photos on the internet (and you will find lots of photos on Maximum Velocity as well). Just don’t get sucked in and waste to much time! 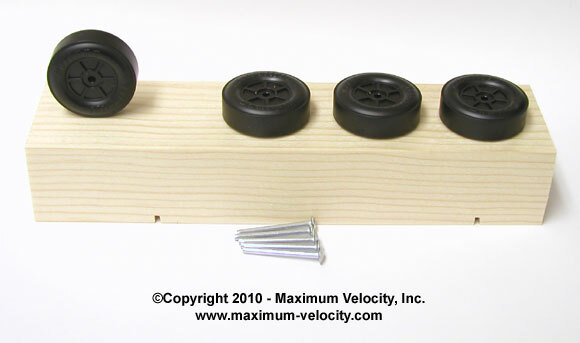 Children generally want to skip the “boring” steps and get right to attaching the wheels. But to get the best results, the building process should proceed in a step-by-step manner. Coach your child to take one step at a time. The resulting car will not only end up nicer, but your child will begin learning the valuable skills of organization and patience. Training experts tell us that people learn much more quickly by performing a task themselves, than by watching someone else perform the task. So, if your child is unfamiliar with using a tool (you can assume that your child is unfamiliar unless you have previously shown them how to use the tool), place their hand(s) on the tool in the proper position, and put your hands on top of your child’s hands. Work with your child, using your hands to guide and add a little muscle power. This is especially useful when a younger child is sawing. To saw along a line takes a certain amount of strength and technique, and young children can become frustrated very quickly. By adding your hands, your child will not only be involved in creating the car, but they will also become better at working with their hands. Kids generally don’t like to sand (I don’t blame them). But to end up with a nice paint job, the car does need to be virtually smooth. In the past, my kids would sand for a minute or two and then come to me and say, “Daddy, is this enough?” I would tell them no, they would go back to sanding for another minute, and the process would repeat many times over. Then someone shared with me an amazing technique. Take a pencil and scribble on all surfaces of the car that need to be sanded (lightly on surfaces that are almost done, and heavily on very rough surfaces. Then tell your child to sand until all the pencil marks are gone. At my house, this eliminated a lot of whining! If your child is a noted procrastinator, a daily schedule might be appropriate! Good luck in coaching your child. When you get the urge to jump in prematurely, put your hands behind your back, grit your teeth, and count to 20. A fellow had a buzzard for a pet and decided to take him to Hawaii on vacation. He realized it was a long flight and that he couldn’t afford the exorbitant fees charged by air lines for extra luggage. He wasn’t prepared for Delta to deny boarding to his pet buzzard, Buford, though. Seems Buford had too much carrion baggage. 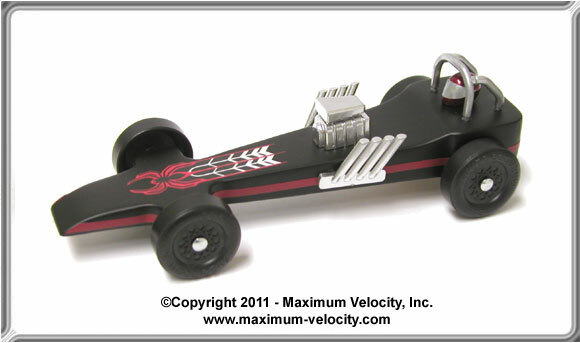 Are you looking for quality pre-cut pinewood derby kits at an attractive price? 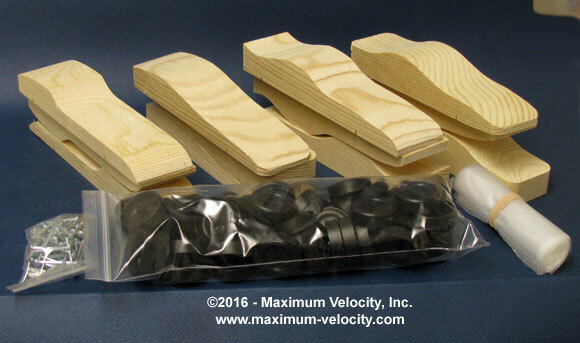 Consider the Maximum Velocity pre-cut bulk kits. Each bulk pack contains three each of four different car models. Wheels, axles, baggies and instructions are also included. Through February 6, 2019, you can get bulk packs of pre-cut car kits for 10 percent off. To take advantage of this limited time offer, add a bulk kit to your shopping cart and use coupon code JAN23NL during checkout. Today we have three exotic cars from Bob Patty. 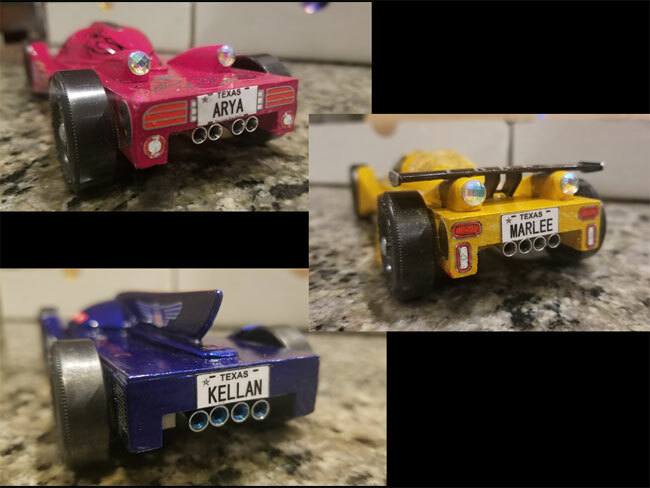 My grandkids and I just completed their Pinewood Derby cars and we wanted to share a few photos of them with you. They aren’t due to race for a few weeks, so don’t have any race results for you as yet but will be glad to let you know how they did when the races are done. 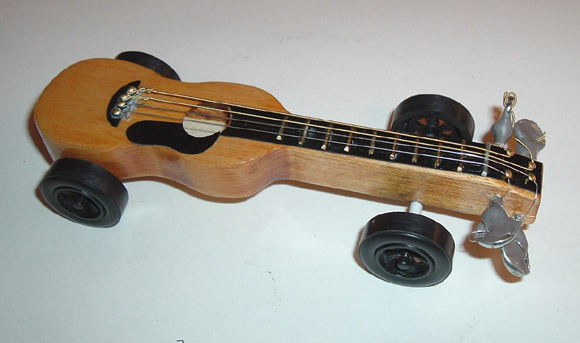 I have two sons in Cub Scouts and they both absolutely love the pinewood derby. My older son could not think of a design this year so he asked Mom; she came up with the idea of a guitar. I thought, “How can I make this?” I drew out some plans on paper and it started to come together. The more we worked on it the more it took shape and the more excited we got. Finally, it was done, and race day was here. All the adults thought the design was sure to get best of show, however the kids had not voted yet. We held the race and the car held its own but failed to finish in the top three. Then the kids lined up to judge the cars for best of show. I could tell my son’s anticipation was growing – so was mine. We had spent a lot of time on the car and were hoping it would pay off. In the end the kids did not vote for it and my son went home with only a participation trophy. My other son picked an easier design and ended up with a third-place trophy and best of show for his grade. Go figure! The moral of the story is, have fun and enjoy the time with your kids; they grow up much too quickly. And next time don’t ask Mom for a design suggestion! I bought Max-V-Lube and I know you guys have tested it against several other graphite brands. Have you tested it against XLR8 Ultra Graphite? I understand XLR8 is heavily refined and has much smaller particles or graphite versus regular graphite like Max-V-Lube. My race is this weekend and I need to make a decision on which graphite to apply (Max-V-Lube or XLR8). I did test XLR8 (and other people did as well) and found XLR8 quite inferior to Max-V-Lube, and even inferior to Hob-E-Lube, which is the less expensive PineCar brand. I think XLR8 is just marketing hype, and they didn’t bother to test it. What is the wheel base dimension on your extended wheelbase blocks and kits? We drill the axle holes at 11/16 inch from the ends of the block. So, the distance between the axle holes is 5-5/8 inch. This insets the wheels just slightly from the ends of the block. So, if the block gets shortened from shaping or sanding, the wheels will not stick out past the front of the car. I have a little girl who is starting Girl Scouts. 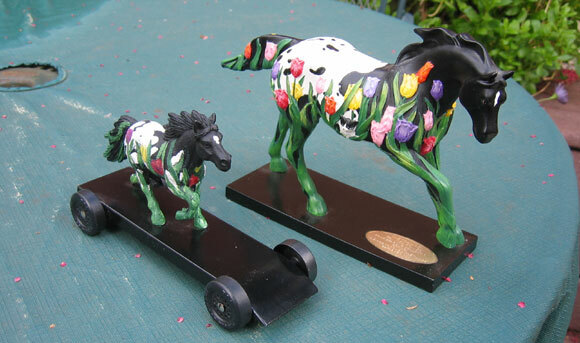 Do you have any background knowledge of the girl scout racing derby? I think someone mentioned that their race is called the “Powder Puff Derby.” Granted, all the same physics principles apply. But I was curious if they use the standard Cub Scout Car kit or have their own. It used to be that the Girl Scouts used the official Cub Scout kit. But with the introduction of girls into Cub Scouts, many of the Girl Scout troops are moving away from using BSA supplies. So, you would need to find out what kit your daughter’s troop plans to use. (Many troops are now using our MV Basic Car Kit). It’s possible that if the race is not soon, they may not have made a decision yet. But regardless of the kit type, we have supplies for most kits. So, I’m sure we can help. If you want to “push” the troop our way, the MV Basic Car Kit is a good choice.